Douglas “D’Silva” Silva de Andrade of Castanhal, Para, Brazil and Petr “No Mercy” Yan of Omsk, Russia were two of the mixed martial artists who competed at “UFC 232.” It was the final event of the Ultimate Fighting Championship for 2018. Featuring 13 MMA bouts, “UFC 232” took place at The Forum, Inglewood, California, USA on December 29, 2018. Silva de Andrade faced Yan in the sixth bout of the evening. Born in Russia on February 2, 2011, Yan has been competing professionally since 2014. He is training out of Tiger Muay Thai and MMA in Phuket, Thailand. 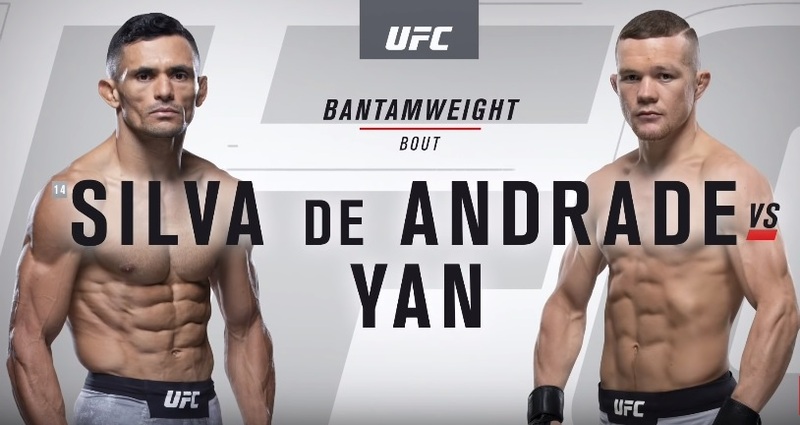 “UFC 232” marked Yan’s third UFC bout. He was coming out of his two consecutive wins in the promotion. Silva de Andrade was born in Brazil on June 22, 1985. He has been competing professionally since 2005. “UFC 232” marked the Brazilian fighter’s sixth UFC bout. He was coming out of a unanimous decision victory over Marlon “Chito” Vera of Albuquerque, New Mexico, USA at “UFC Fight Night 125” on February 3, 2018. Silva de Andrade and Yan competed in the bantamweight division. Referee Mark Smith put a stop to the contest after two five-minute rounds. In the end, Smith raised the hand of Yan, who was declared the winner via technical knockout via corner and stoppage. It improved the professional MMA record to 11 wins and 1 loss. Yan is still undefeated in the UFC. He is riding a six-bout winning streak. On the other hand, Silva de Andrade now has 25 wins, 2 losses and 1 No Contest. It was the third time he lost in the UFC octagon. In the co-main event of the evening, UFC Women’s Bantamweight Champion Amanda “Lioness” Nunes of Salvador, Bahia, Brazil challenged UFC Women’s Featherweight Champion Cristiane “Cris Cyborg” Justino of Curitiba, Parana, Brazil. The challenger became a two-division champion by knocking out the defending champion in the first round. In the main event, Jon “Bones” Jones of Rochester, New York, United States and Alexander “The Mauler” Gustafsson of Stockholm, Stockholm County, Sweden competed for the recently vacated UFC Light Heavyweight Championship. The American contender redeemed the title he previously held by knocking out his Swedish opponent in the third round.